Hello, Pablo. How are things going? How is 2019 shaping up for you? A: Very good. Thanks for hosting me at NeuFutur, James. 2018 has been indeed a very exciting year from the musical perspective and I envision great things will also happen next year as I have started working on a new music project which I hope will expand horizons much further beyond “Nobody’s Land”. You have a new album out. What is the significance of the album’s title? A: Nobody’s Land is my 17th album so far and I have been continuously evolving musically since I first started producing my own music back in 2003. In this case, Nobody’s Land is a concept I use very much in my life meaning you are stepping into a zone which doesn’t belong to anyone, some sort of “inert place” if you will, in which you can do anything you like most, without others’ permission. That’s how I feel or perceive this particular album. I left off all the preconceived ideas on what I should be playing, how I should sound, and literally gave the leash away. Jazz Fusion is a great genre to accomplish this, as you are less bounded by what typical Jazz music should sound, in favor to explore other musical concepts which not necessarily belong to the Jazz world. Incidentally, the first track created and produced in this album is the album track, and without truly knowing where I was going with it, it helped me pave the layout of the rest of the album. In a related vein, what tracks do you feel are the strongest (or are your favorite) on the record? A: I think this is a very difficult question, as to me, each track has its own story and message behind. To be fair, I struggled for quite a long time to decide how the album should be laid out, so I intended to create some sort of movement and dynamics across the tracks, going up and down emotional hills, excitement points, spiritualism, darkness feels, etc. In my mind, this creates some sort of sequential tales effect, while still hoping to keep consistency throughout the album. I envisioned this is what listeners would be able to experience while actively listening to it. Tracks such as “Tell Your Story”, “Wistful Smiles” and “The Days’ We’ve Lived” have a preferential emotional load carried through, to me. A few months back, some singles from Nobody’s Land were featured on ReverbNation. What impact did the service have on your fan base? A: In my experience, ReverbNation is a great resource for any unsigned musician, and of course a great opportunity to get exposure to the public. But the fundamental impact is in the useful feedback I receive on my music by objective listeners. I examine their feedback very actively, so I am able to perceive what the listeners feel. And so understanding how to adjust and re-consider music trends and opportunities to expand and grow as a musician, which is not that obvious if you create and produce your own music, while not performing live. You have some pieces on your website about music production. What sort of suggestions would you give to a novice in the field that wishes to make production a more full-time pursuit? A: This questions typically opens a very fundamental discussion. Things to consider are: first, today’s audio technology is available and affordable for most of home studio owners and it is significantly better than thousands (or even hundreds) of dollars’ worth gear in professional recording studios back then. Secondly, knowledge and experience is much more accessible than several years ago as well, audio processing, mixing and mastering courses are available online, and even though not all material is considered a true professional piece of advice, some of them can effectively guide through the process of working the way out in the production process at home. Learning from experienced professionals is key. Lastly, improving your music production skills is not a one magical step ahead to sort things out. People must understand that because music is an art, its production cannot be left off to machines or computers to make aesthetical decisions for us. What may sound good to someone , may literally drive others insane, however there are some basic rules in the music production arena which are well worth to learn , and then decide whether to break them or not based off what the intent and direction of the project might be. Speaking from my own experience, it took me about 15 years to bring my music production skills to a place where I wanted them to be, every time I mix a new track I learn something new and it becomes one more element available in my tool box. This is by no means intended to be intimidating, but only to emphasize how critical the learning process is in music production. You remastered Nobody’s Land. What major changes exist between the two versions? A: At the time I started processing the publishing of the new album, my studio went through a major upgrade process. Among other modifications, we have added new mastering gear along with new mastering techniques the new tools could support. The new masters couldn’t make it on time for the planned album release date so once I finished the album re-master, I published the new mastered version on my web site, so to allow listeners to gain quick access to it. There are fundamental changes in the new master quality, but there are no changes that were made to the original tracks. They just sound that much better!. Currently, anyone purchasing the original version of the album is entitled to a free download of these new masters from my website. What stylistic changes were made between your previous album What Comes Into Play and Nobody’s Land? A: Nobody’s Land includes a much wider span of music styles, as I allowed more flexibility to capture different music arrangements and interaction between instruments not typically seen in other albums I produced in the past. I also put much more focus on guitar playing. I have explored improvisation more in lines with traditional jazz music, as reflected in tracks “Same Old, Same Old”, “Estela” and “Rubberneck”. It is also worth noting that more Latin Jazz influences are seen in this album as well, such as in track “Dragonfly”. All these stylistic changes are the result of my continue effort to explore and acquire different musical skills in my instruments studies, which directly contribute to my growth as a musician. 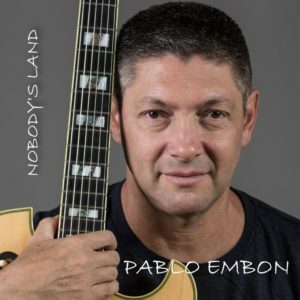 Where can listeners get a hold of Nobody’s Land? A: The officially released album can be found on CDBABY (and all their worldwide digital distribution partners) and ReverbNation Stores as mp3 download. The new master version of the album in CD quality can be exclusively downloaded on my website. Thank you so much for your time. Do you have any other comments or thoughts for our readers at NeuFutur? A: Thank you for having me on NeuFutur.